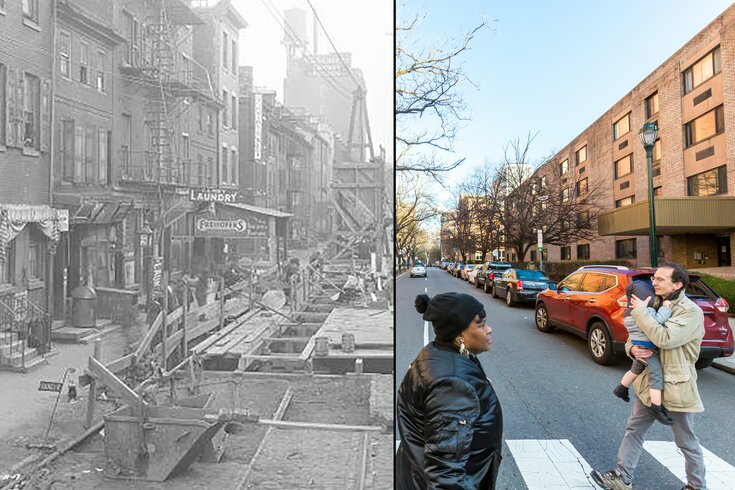 You don't need 10 photos to tell you how much Philadelphia has changed in 100 years, but it sure makes it easier to picture. Some of the biggest changes to our nation's history will take place in 2017 – from Donald Trump taking over the presidency and medical marijuana becoming available in Pennsylvania to Philadelphia adopting the first soda tax in any major U.S. city. 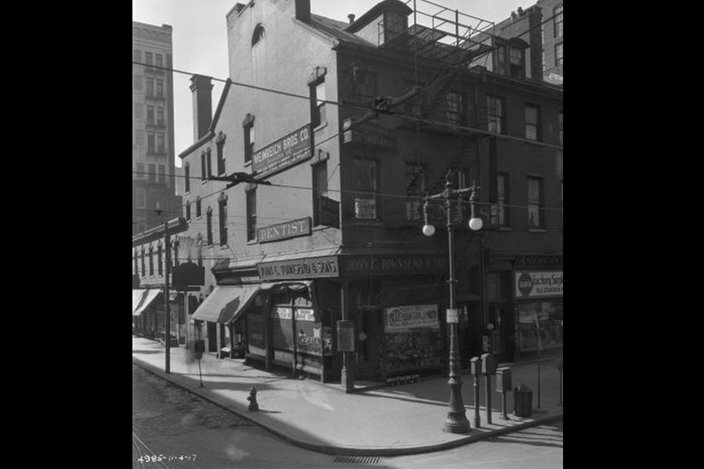 In the spirit of those changes, we have dug back through PhillyHistory.org's archives to 1917 to show a much different time. 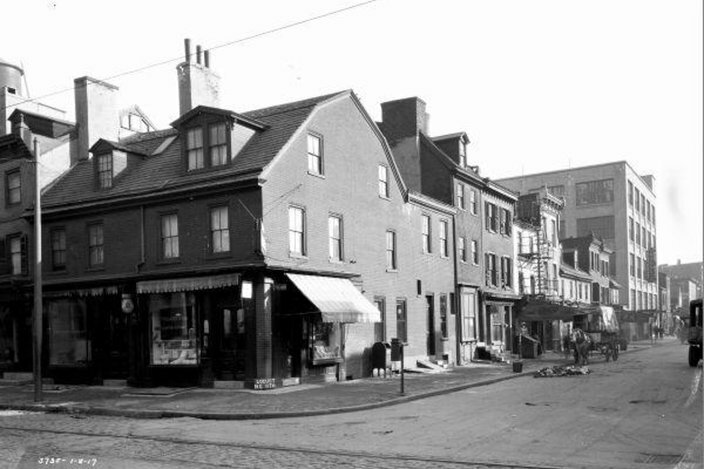 In the throes of major industry and development, Philadelphia's main thoroughfares were lined 100 years ago with Ford Model Ts, small shops, homes and some horse-drawn carriages. 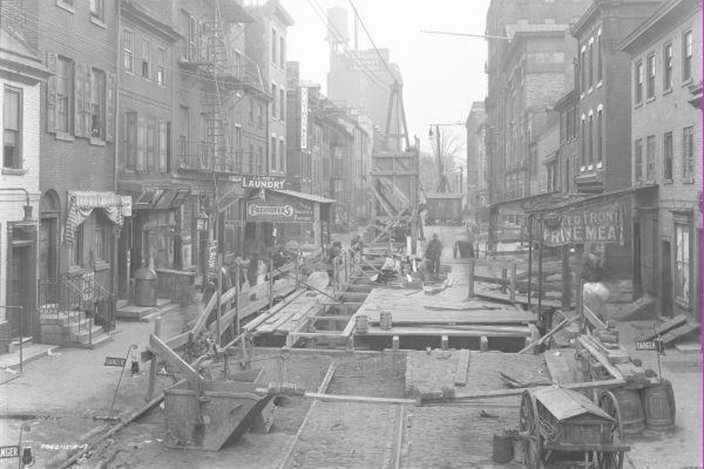 In 1917, the Broad Street and Market-Frankford lines were under construction, and Philadelphia Mayor Thomas Smith, a Republican, was battling charges of "conspiracy to murder" a police officer during Primary Election Day. But much has stayed the same. Note in the 10 photos recreated by PhillyVoice photographer Thom Carroll below all that has stood strong for 100 years. 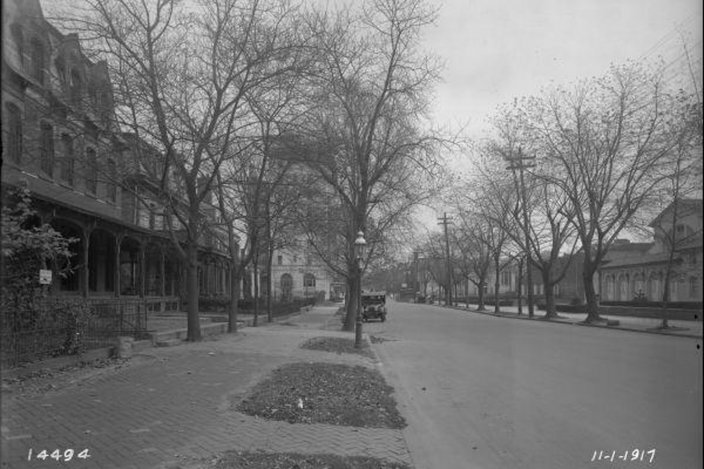 Looking east on Walnut Street, this part of University City has maintained some of its history during the last 100 years. The Rotunda, seen on the right, is now an arts and culture center and is a part of the University of Pennsylvania Facilities and Real Estate Services Arts Portfolio. The Rotunda was built in 1911 and served as a house of worship for members of the First Church of Christ Scientist. Penn bought the building in 1966 as part of a "community investment strategy." The Fresh Grocer supermarket that's now at the end of this block has been a place for the community to buy groceries for 15 years now. 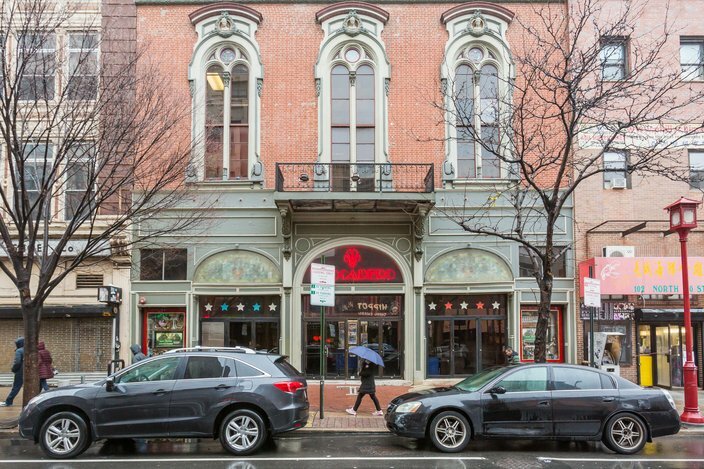 Its building is owned by Penn and the store is fighting to stay in the location while university officials are considering replacing the "FroGro" – as it is known in the neighborhood – with an Acme Market. 2017- Broad and Arch Streets. 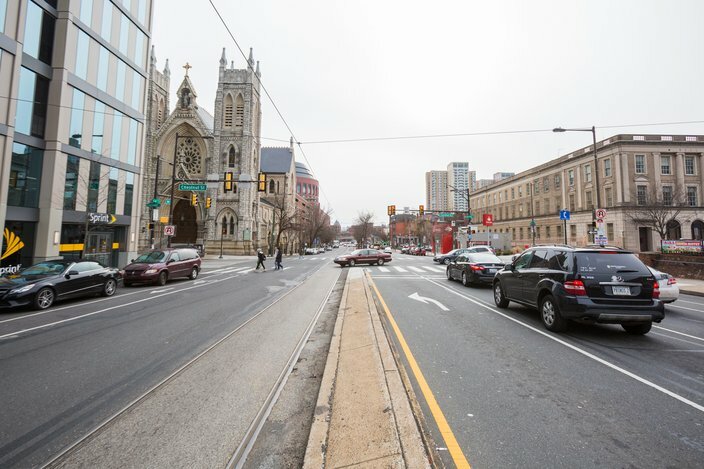 The most striking difference in the photos of Broad and Arch streets is the difference in the cars zooming up and down one of Philly's busiest roadways. In 1917, the most popular vehicle was Ford's Model T. In 2016, the best-selling vehicle was the Ford F-Series pickup truck, according to Business Insider. The glass building on the right side of the street in the 2017 photo is the Broad Street Atrium of the Pennsylvania Convention Center. The convention center, which spans four city blocks, opened in 1993, and expanded west to Broad Street in 2011. It is home to popular events like the Philadelphia Auto Show and Philadelphia Flower Show. The Arch Street United Methodist Church – the building seen in the right corner of both photos – has remained nearly unchanged. The church was built in 1862, long before City Hall opened its doors in 1901. 2017- 11th and Locust Streets. 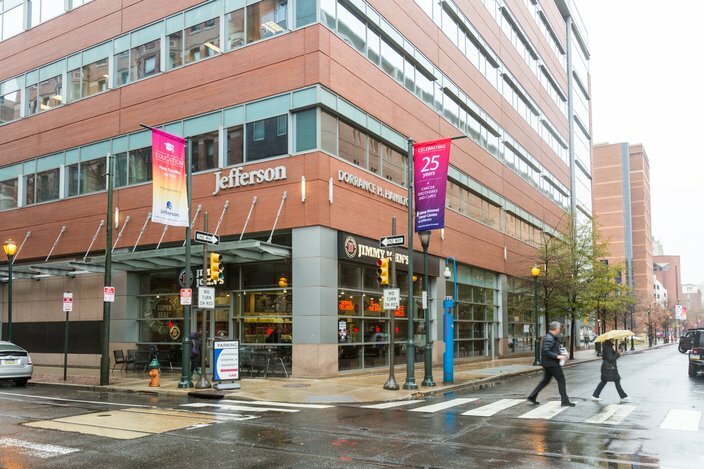 Once home to a mix of storefronts and homes, Thomas Jefferson University's Dorrance H. Hamilton Building – and a Jimmy Johns sandwich shop – have taken over the northeast corner of 11th and Locust streets. The Hamilton building is an academic building touted by Jefferson as "the most significant transformation of its urban campus in almost two decades." 2017- The Trocadero Theatre, 10th and Arch Streets. The Trocadero Theatre's facade still contains many of the obvious architectural elements it had a century ago, despite some structural changes. 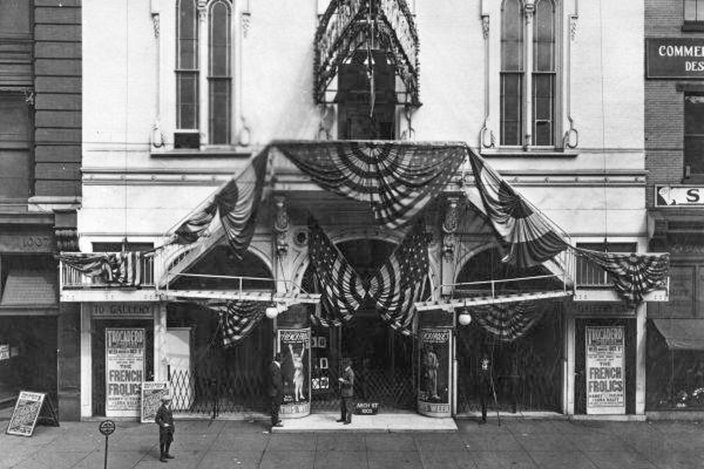 The theater opened its doors in 1870 as the Arch Street Opera House. Thespians, musicians and even traveling minstrels performed there often in the venue's early days, but in the 1950s it became famous for its burlesque performances, a first among the venue's many incarnations, according to its website. In the 1970s, the Troc transformed into an art house cinema and fine arts theater. It was a dance club in the 1980s, then went through a heavy punk phase (didn't we all) until graduating to what is now – a venue for all genres and musicians. The Trocadero also holds special events and movie screenings. 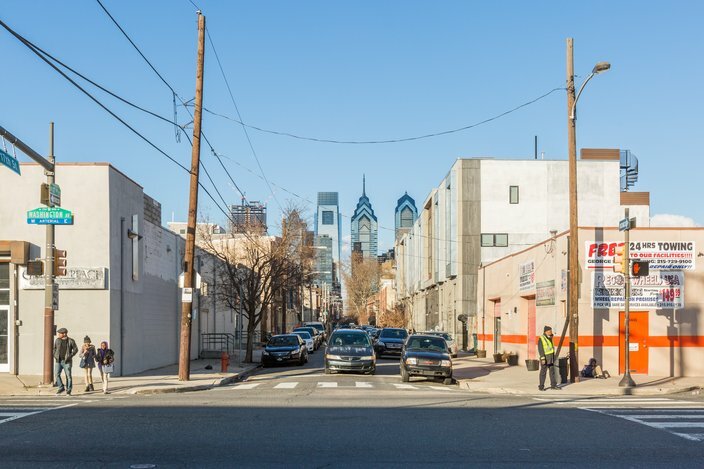 2017- 17th Street and Washington Ave.
Washington Avenue was a major industrial hub a century ago where large buildings – like the John Wanamaker clothing factory, Curtis Publishing and the American Cigar Company – inhabited much of the street west of Broad. Today, that portion of Washington Avenue attracts contractors who go there to buy building supplies, granite countertops, ceramic tile and cherry wood cabinets in bulk. 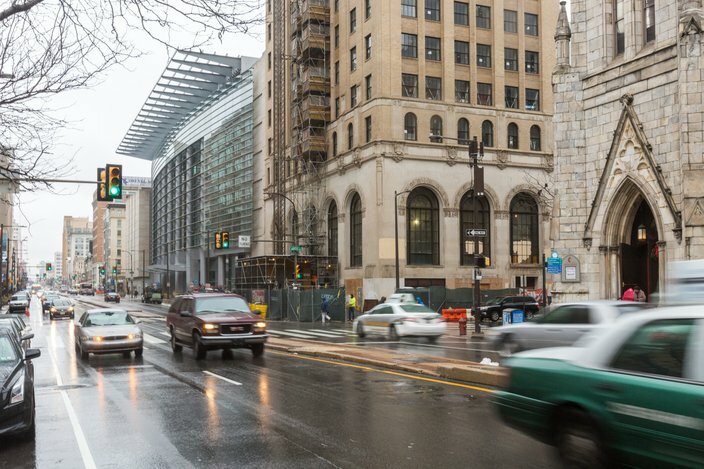 The Center City skyline is the most notable change in these photos. Staring straight back at pedestrians looking north along 17th Street from Washington Avenue is One Liberty Place built in 1987 and the Comcast Center, which has towered over Philadelphia since its opening in 2008. 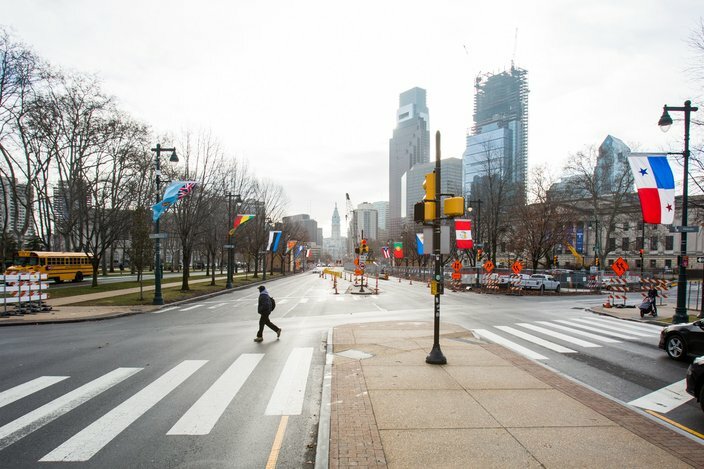 2017- 21st Street and the Benjamin Franklin Parkway. 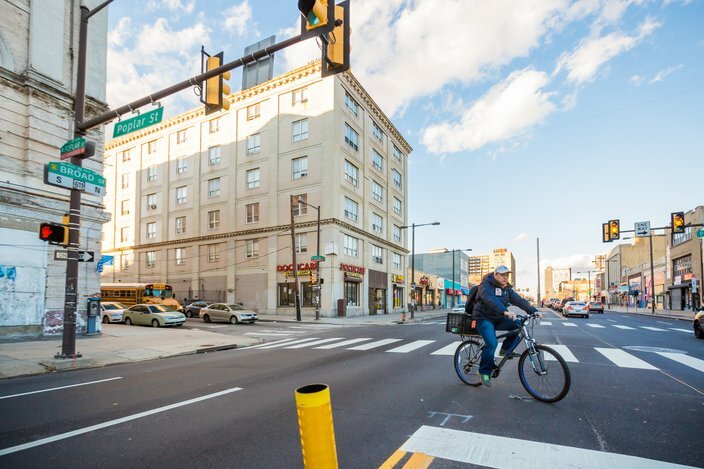 The only familiar sight that has remained visible from this vantage point at the intersection of 21st Street and Benjamin Franklin Parkway for the last 100 years may be City Hall, built in 1901. 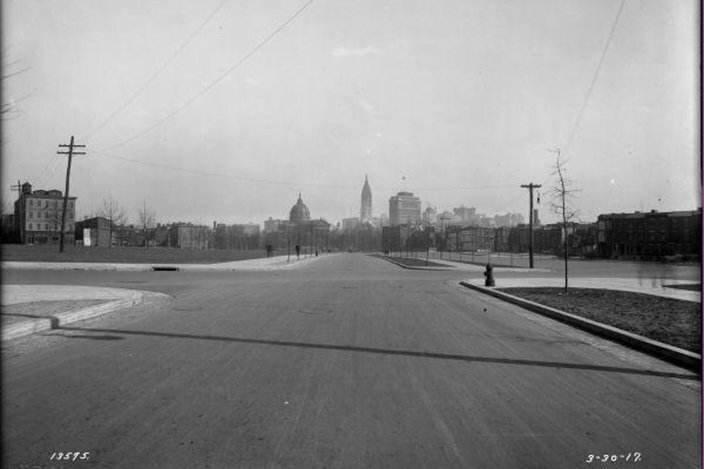 Philadelphia City Council first proposed for two, large boulevards to run from Philly's suburbs into the city in 1858 and unanimously passed a bill for plans for what was then known as the Fairmount Parkway in 1892. 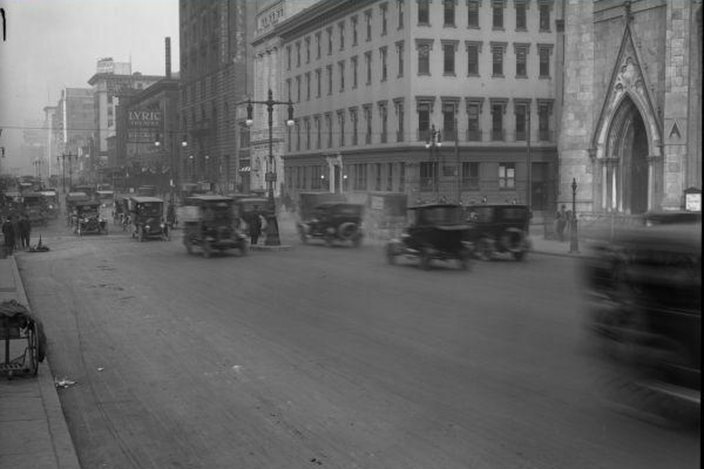 Construction of the parkway officially began in 1917, according to the city, and was completed in 1926. Though, the archdiocese's Cathedral Basilica of Saints Peter and Paul built in 1864, seen in the original photo, is still at 17th and Race streets, it is obstructed by trees and new construction in the more recent picture. 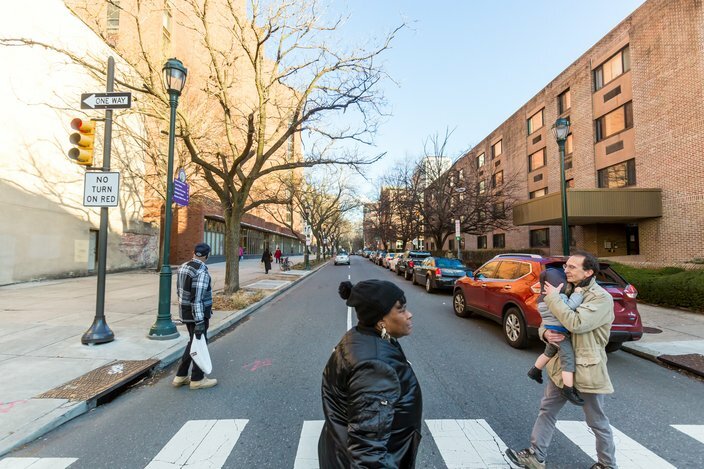 The parkway has been home to some of the largest events in Philly's history. Recently, Pope Francis celebrated Mass at the location during his first visit to the United States as part of the World Meeting of Families in 2015. It's also where in September, President Barack Obama, the first black president of the United States, campaigned for Hillary Clinton, the first woman nominated for president by a major party. 2017- Broad and Poplar Streets, 2017. Once home to a Buick Motor Company dealership, this space at 900 N. Broad St. is now occupied by Docucare Copy Service, a company that's been in business for about 20 years, according to its website. Seen in the left corner of both photos is the Metropolitan Opera House. Opening in 1908, the venue was renamed The Met in 1910 when it was sold by its former owner. The Met stopped holding its operas and plays and was converted into a ballroom in the 1930s and later a sporting venue before being sold and converted into a large church. 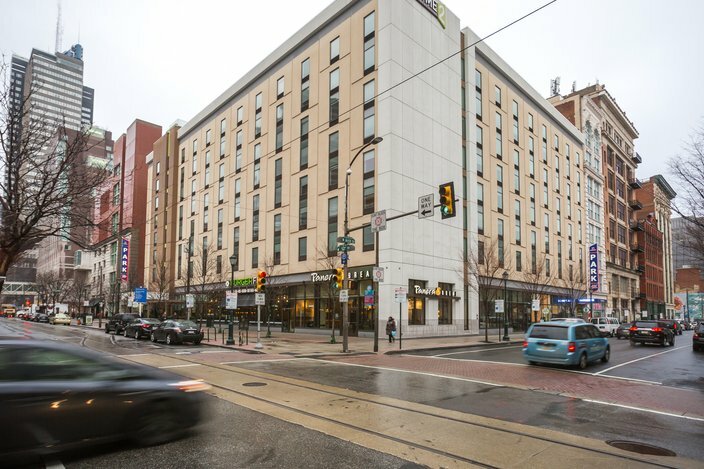 Developer Eric Blumenfeld, who's also behind the redevelopment of the Divine Lorraine Hotel, bought the theater four years ago and is planning to redevelop the property, Curbed Philly reports. 2017- 38th and Chestnut Streets. 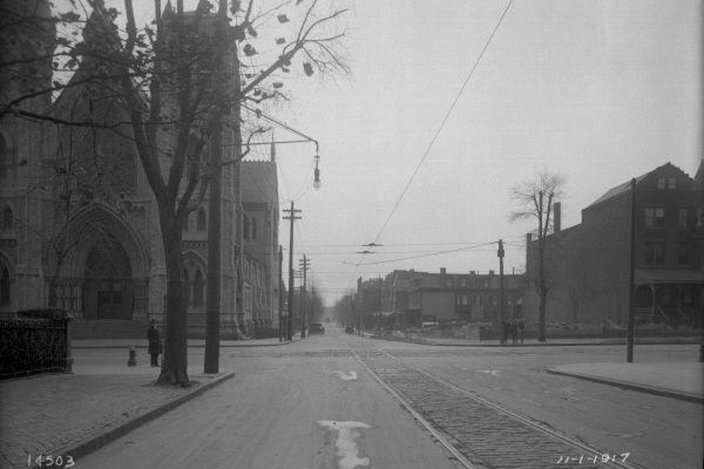 A hundred years later, the St. Agatha-St. James Church still stands strong at 38th and Chestnut. St. James was the first Roman Catholic church in West Philadelphia, founded in 1850, according to the church's website. It merged with St. Agatha's parish, founded in 1865 at 38th and Spring Garden streets, after St. Agatha Church was damaged in a fire. 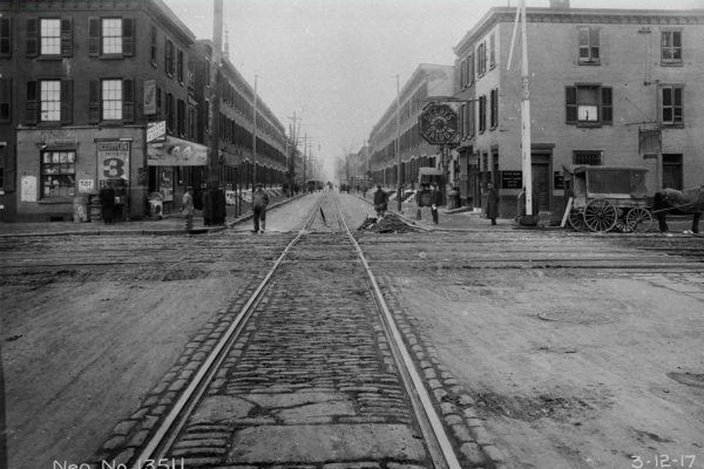 The rest of the streetscape, looking south, has changed dramatically, from the configuration of the streets to the new construction found on both the east and west sides of 38th Street. The Jon M. Huntsman Hall, the rounded building seen peeking from behind the church, is a part of the Wharton School of the University of Pennsylvania – President-elect Donald Trump's alma mater. It was constructed in 2002. 2017- 9th and Locust Streets. 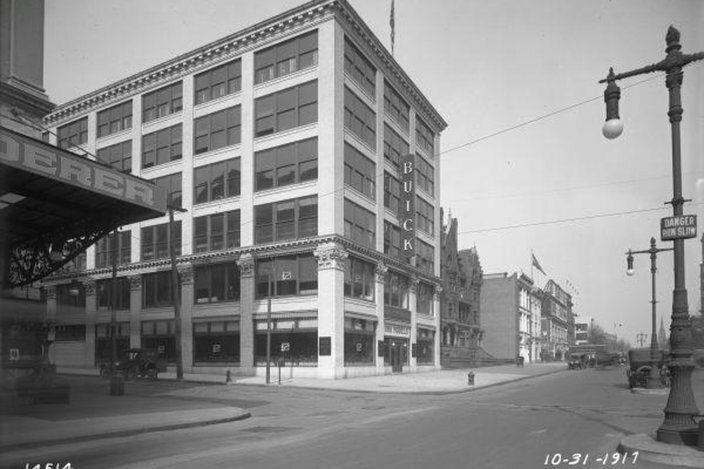 The construction taking place 100 years ago along Ninth and Locust streets didn't stand a chance against Philadelphia's development and redevelopment. 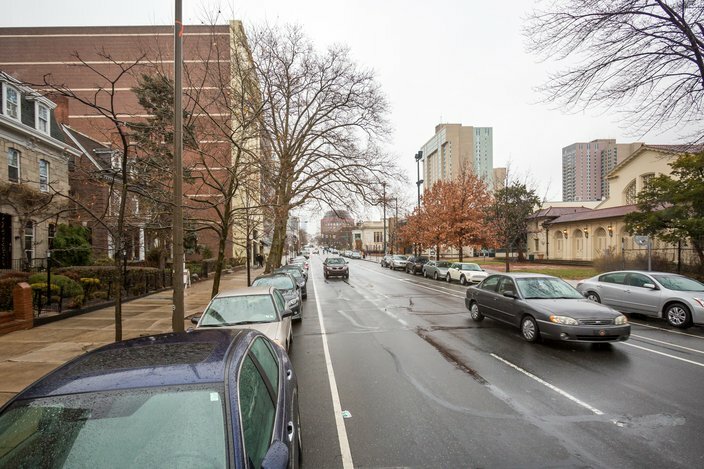 In what may be the most shocking before-and-after photos, the Mazzoni Center Family & Community Medicine, a medical center that serves the city's LGBTQ community, now occupies the north side of Locust while the St. George Cathedral Manor, a senior living facility, sits to the south. The Mazzoni Center will eventually expand into larger quarters at 1328-1338 Bainbridge St.
2017- 12th and Arch Streets. What was once storefronts, a dentist office and Weinreich Bros. Co. – which may have been a jeweler, according to The Jewelers' Circular, a weekly publication started in 1869 – is now home to Panera Bread and BurgerFi restaurants and Home2 Suites by the Hilton hotel. From what we can tell, nothing from the original photo exists 100 years later. Not pictured, on the east side of 12th Street is an entrance for the Reading Terminal Market, which opened in 1892 and remains open today.